The normal weekend rides attract just a dedicated few and so there was a discussion to introduce an extra ride; an all inclusive Social Ride suitable for children to pensioners, for tea shop tourists to racers, for mothers to grandparents. And so our ever attentive Touring Secretary arranged just such a ride for an early January morning and asked Dave Banks to act as Leader and post a route. This gave me my first inkling of doubt as 100km with over 1350m of climbing did not sound very sociable to a doddery pensioner. Never the less I thought I would give it a try. 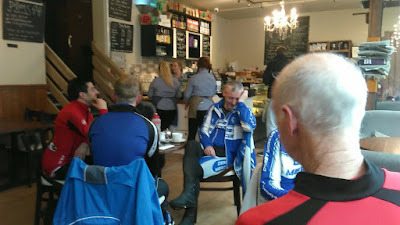 Obviously there is a demand for such a ride as 34 people of all ages, size and fitness turned up at the Broadway for the start and a few others joined us very soon after. And so we set off towards Mickleover- Longford- Mayfield - Ilam - Weaver Hills and the Peaks. I was the first to be dropped but I did hang on to at least the Crematorium. Indeed I managed to re-attach myself to some of the back markers as we entered Radbourne Lane, partly assisted by the fact that Duncan and Sarah Gell were pulling trailers loaded down with children whilst Di, Sasha and Jen took pity upon me, or so I thought. 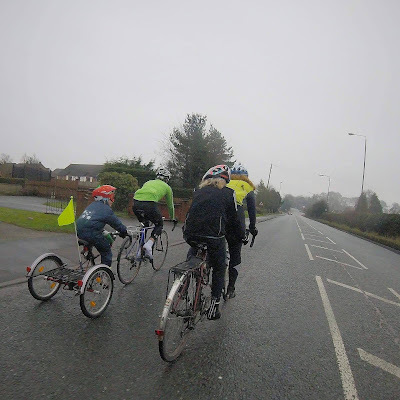 As we sped on towards Longford Di proffered the information that 32kph was a bit too fast for her as an average pace. The main group had stopped and waited for us on Long Lane and so after re-grouping, and taking in lots of gulps of air, we shot off again towards Mayfield where once again the main peleton stopped and waited. Even though we had only done about 30 km, Di said she felt as she had done 300km, I was shattered and Sasha was unable to speak. I am not sure how Ben, a first time guest on a Mercury ride, felt as he was bent double gasping for air. Meanwhile Duncan et famille were still toiling up the hills, it must be hard work pulling a 60kgm load up 15% inclines. There is a short cut here towards Ashbourne which Dave kindly pointed out and offered the information that his route was ' for guidance only ' as he had discovered some more hills which promised fun. FUN???? And so the group split, nine of us split off to Ashbourne, three had already dropped out and gone home, and the true adventurers set off to the hills. I am told that eventually fourteen made it to their coffee stop, at which point a Team Car picked up Ian and Josh Scales with some excuse of having to see a man about a dog ! If you believe that! Of the feisty fourteen only eight survived to grovel over the finish line where upon Mark and Debbie Gray said they had never been on such a Social ride before having covered over 110 km and around 1750 m of climbing. Our Touring Secretary awarded Dave a Special Bonus for having managed to break the World Record of total number of drop outs on ANY ride and having found a route which encompassed more than 20 cattle grids and six slurry heaps. On this latter point it is rumoured that Andy Thomas was nearly divorced when he brought Sam home absolutely covered in S*!t. 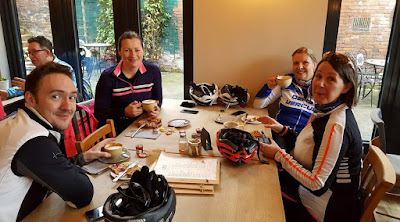 Meanwhile the Splinter Group recovered in Jack Rabbit's at Ashbourne before heading for home..or rather we would have headed for home if Sasha had not instantly gained a puncture, and, in the true style of a touring cyclist, did not have a spare inner tube that fitted her wheel. She was however equipped with a non-fitting inner tube! 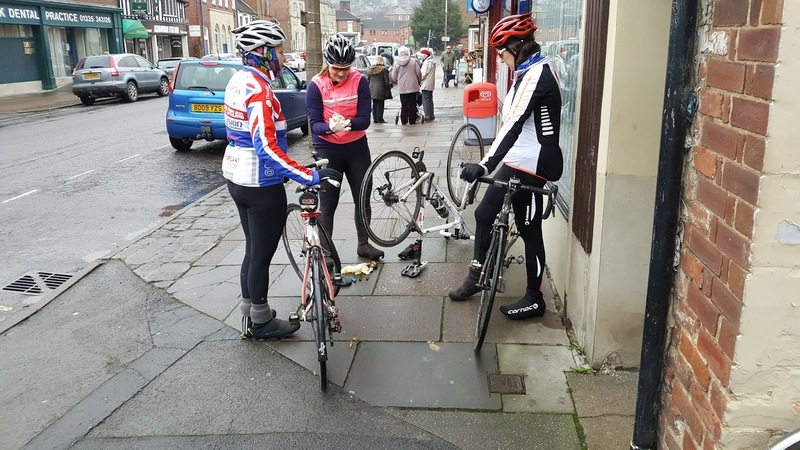 Mechanical interlude over we made our way out of Ashbourne towards Hulland, Mercaston, Kedleston Park and home with various members of the Splinter peeling off en route. As we passed through Kedleston Park Di thought she was in need of the kiss of life but chose her sofa instead. 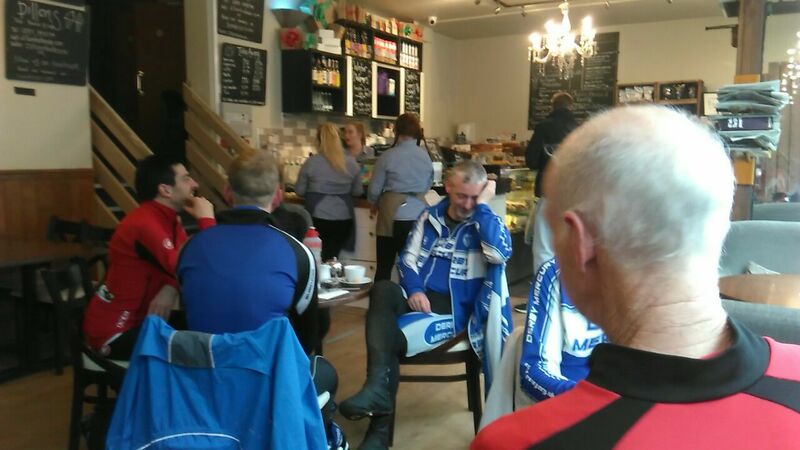 A great and enjoyable day out..but I dread to think what a ' normal ' Sunday ride would be like !! If this was the ride I saw on Strava then it was NOT social. 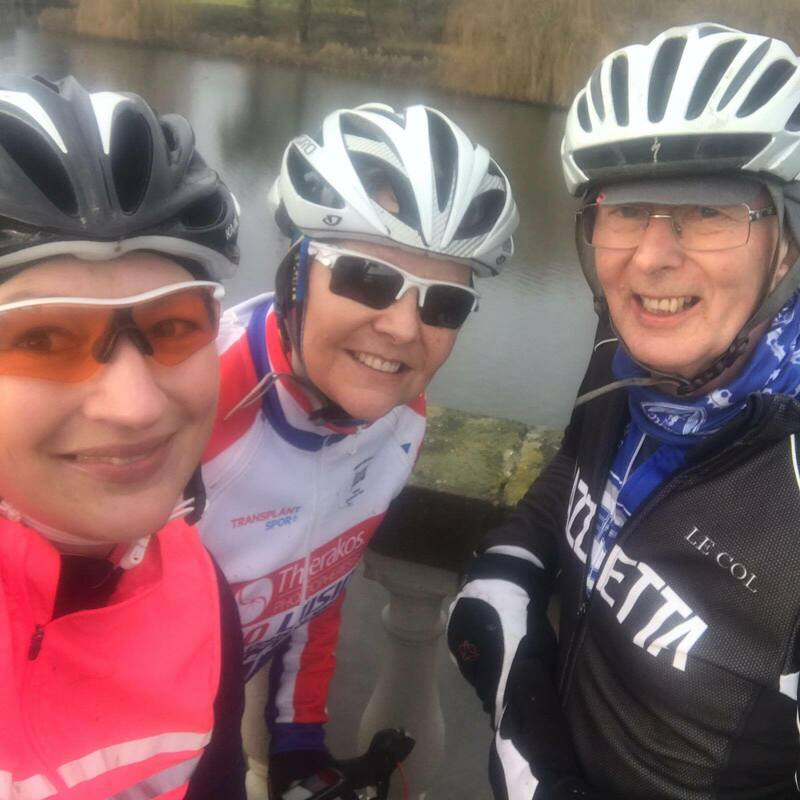 I did the ride a couple of weeks ago and loved the climbing but would not have kept up with the main group at all. In the end at Ashbourne I just took the easy route home! 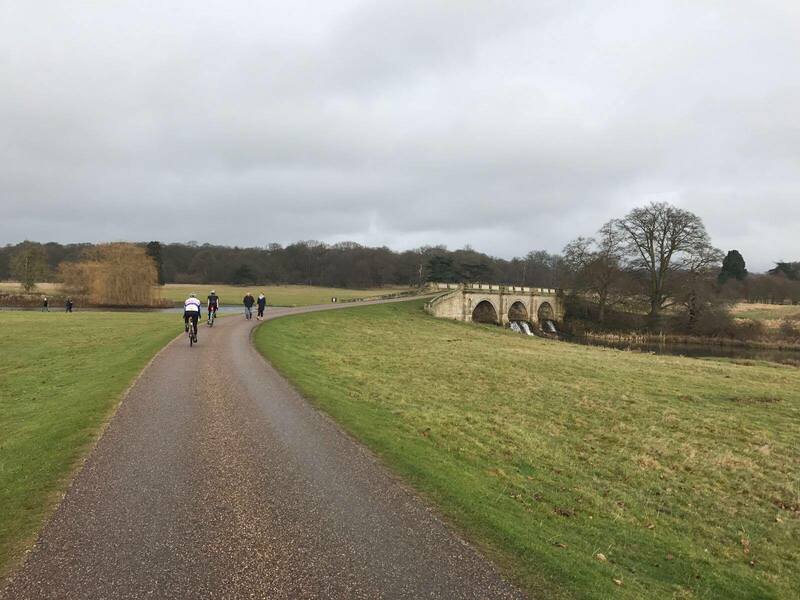 Great report on a 'most unusual' social ride Peter. Trevor, next weekend I am leading the Second All Inclusive Social Ride which I assure you WILL be all inclusive and very social! !